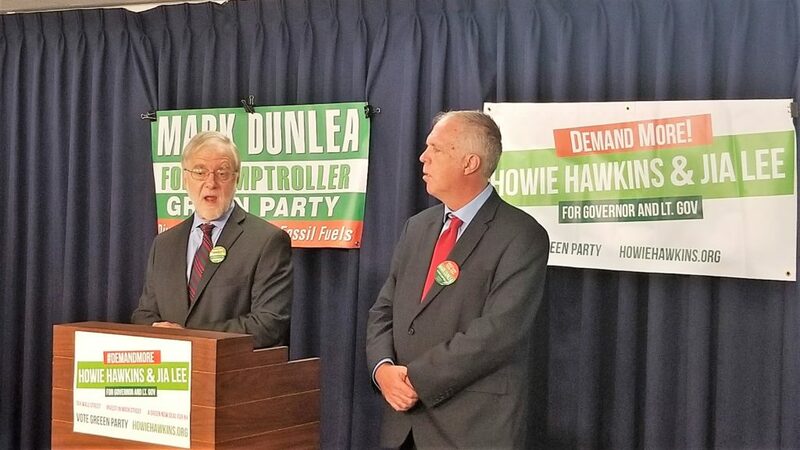 Green Party gubernatorial candidate Howie Hawkins, left, and Green Party comptroller candidate Mark Dunlea, right, speak to reporters at an Albany press conference on Tuesday. The Green Party’s gubernatorial candidate Howie Hawkins made an appeal to progressive voters who pulled the lever for Cynthia Nixon, Jumaane Williams and Zephyr Teachout on Primary Day – support the Green ticket on November 6. “The Green general election ticket is Plan B after the primaries for progressive voters,” Hawkins said during a stop in Albany Tuesday. The Green Party wants New York to set a goal of 100 percent clean energy by 2030, single-payer health care, ethics and criminal justice reforms, ranked-choice voting, proportional representation in the Legislature, full public campaign finance based on the Clean Money system used in Arizona and Maine, term limits for state officials, bail abolition, speedy trial, marijuana legalization, and sanctuary state policies to protect immigrants. Appealing to progressives who voted for Nixon, Williams, and Teachout in the recent primary, Hawkins called on them to support the Green gubernatorial ticket of Hawkins and Jia Lee, as well as Michael Sussman for attorney general and Mark Dunlea for comptroller. Hawkins said the Green candidates are veteran activists of progressive movements, and are the most qualified for their offices. “The New York Times Magazine recently argued that life on planet is probably doomed due to the inability of politicians to set aside partisan bickering to launch an emergency mobilization to avoid the worse of climate change. The clear solution is to vote in the Green Party because we are committed to doing what is needed to avoid climate chaos,” said Dunlea, who wants the state to divest its pension fund from fossil fuels. “The good news is that we largely know how to move to 100 percent clean energy while creating millions of jobs, cutting deaths from air pollution, and lowering energy costs. All we need is the political will to act and the Greens have that in abundance,” Dunlea added. “Nixon urging Cuomo to get behind the Climate and Community Protection Act, which the state Assembly has passed three times, is ironic because it mostly codifies Cuomo’s own energy policy. We need to fight for passage of the New York Off Fossil Fuels Act, a plan for 100 percent clean energy by 2030, with the same sharp focus we had on the fracking ban in 2014,” Hawkins said. Hawkins, who is campaigning as an eco-socialist, said that now that the primary is over, there needs to be a much more open discussion about what being a progressive means in New York rather than the narrow debate during the Democratic Party primaries. “While I certainly agree we need to end the Trump presidency as soon as possible, the gubernatorial election needs to focus on concrete proposals for what New York can do statewide to strengthen the common good for the state’s residents,” added Hawkins. Hawkins is proposing four regional debates between now and the General Election on November 6 — one each in the New York City metro area, the Capital District, Central New York and Western New York — with each debate focusing on a topic: the economy, government reform, the environment and climate, and social policy, including education, health care, criminal justice, and civil rights. One issue where Hawkins disagrees with both Nixon and Cuomo is the governor’s property tax cap, which Hawkins says has done nothing to reduce sky-high local property taxes but has prevented local governments from funding needed services and improvements. Whereas Nixon wants to tweak the tax cap, Hawkins wants to repeal it and instead have the state pay for its unfunded mandates on county and local governments and restore revenue sharing with local governments to 8 percent of state revenues. Hawkins calls New York’s school the most segregated in the country. Hawkins and Lee want to scrap high-stakes testing to evaluate teachers, schools, and students. The Greens charge that the real goal of such testing is to attack teachers and put high-poverty schools into receivership and then privatization into charter schools. Hawkins is also calling for progressively graduated tax brackets on multi-millionaire incomes and retaining, rather than rebating, the stock transfer tax. “The 1 percent can afford to contribute more. We need to fund a Green New Deal to revitalize public sector services and infrastructure,” he said.